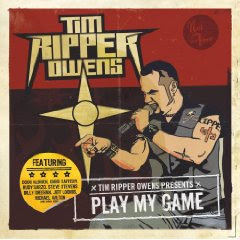 Hall of the Mountain King: Review: Tim "Ripper" Owens, "Play My Game"
I’ve held off on this review for a while, hoping the record would grow on me a little more, but I think it’s time to let it go. You won’t find a much bigger fan of Tim Owens than me (you may remember my rants when he was booted from Iced Earth last year), but as a songwriter, I continue to be somewhat disappointed by his efforts. Here he’s recruited guys like Bob Kulick, Chris Caffery and John Comprix as co-writers, and a pretty impressive stable of musicians, including Jeff Loomis, Rudy Sarzo, Simon Wright, Steve Stevens, Bruce Kulick, Caffery, Michael Wilton, Doug Aldrich, Dave Ellefson, Marco Mendoza, James Lomenzo and others as backup. Not surprisingly with that lineup, the music is rock solid. The problem, surprisingly, comes in the area where Owens should be most adept — the vocal melodies. For a guy with such a great voice, the melodies here are often vanilla and occasionally even awkward. A beautiful example of what I’m talking about is on second track, “Believe,” which features this gigantic guitar riff from Comprix and a vocal melody from Owens that’s like listening to paint dry. There are some shining moments on the record. “It Is Me” is hands down the best tune on the record with a grinding, heavy riff from Comprix and some of Owens’ best vocals here. Even it has problems, though, as do several other songs, with some awkward lyrics. The Priest-influenced tune “The Cover Up” is another winner (despite the Area 51 cliches) and benefits from a ripping Loomis lead. Surprisingly one of the better moments is the ballad “To Live Again,” which features a huge chorus that shows some nice vocal control from Owens. The title track opens with a nice bouncing riff and one of the most aggressive vocal deliveries on the record, and it features a nice shift to a plodding chorus. It reminds me (and I’m sure Owens would had this comparison) of some of Rob Halford’s work with Fight. Finally, the fanboy in me has to favor the final track, “The Shadows Are Alive,” co-written and performed with Savatage guitarist Chris Caffery. It’s one of the most varied pieces on the album, opening in a ballad mode, then moving to a traditional metal piece and finally a power metal-influenced ending. It also really allows Owens to show his full range. It’s a strong ending to the record and makes the songs that came prior to it even more disappointing in a way. There are also a few numbers here left in limbo despite some strong moments. Album opener “Starting Over” has some nice depth and tasteful guitar work from Bob Kulick, and the verse is nice, but the chorus just doesn’t seem to fit. Similarly, “No Good Goodbyes” has an interesting Alice in Chains influence and some good guitar work from Bruce Kulick, but it falls apart with the chorus which again just doesn’t impress. In the end, you’ve got five really good songs, two or three middle-of-the-road numbers and an awful lot of uninspired and unmemorable filler on a 12-track album. Owens’ voice is great as usual, and I can’t fault the musicianship with the all-star cast. It’s just that many of the songs just don’t ever come together. "Play My Game" is a better than average record, but probably not that defining moment that Owens’ fans were hoping for from the first record where he’s calling all the shots. The truth of the matter is, "Play My Game" isn’t bad, but if Owens wants to be seen as more than a hired gun, he’s really going to have to up his game in the songwriting department.